Last year I had the opportunity to go to Tianjin for the first time. I have to admit that previously I had not had a great desire to go to Tianjin. I always imagined it as a big, dirty, industrial city. But I guess things have changed over the years. I had a couple days in Beijing where I met some friends so we decided to take the new bullet train out to Tianjin. It only took 28 minutes. I had a former graduate student who was from Tianjin. Her parents were kind enough to pick us up at the train station, show us around the city, and feed us well. 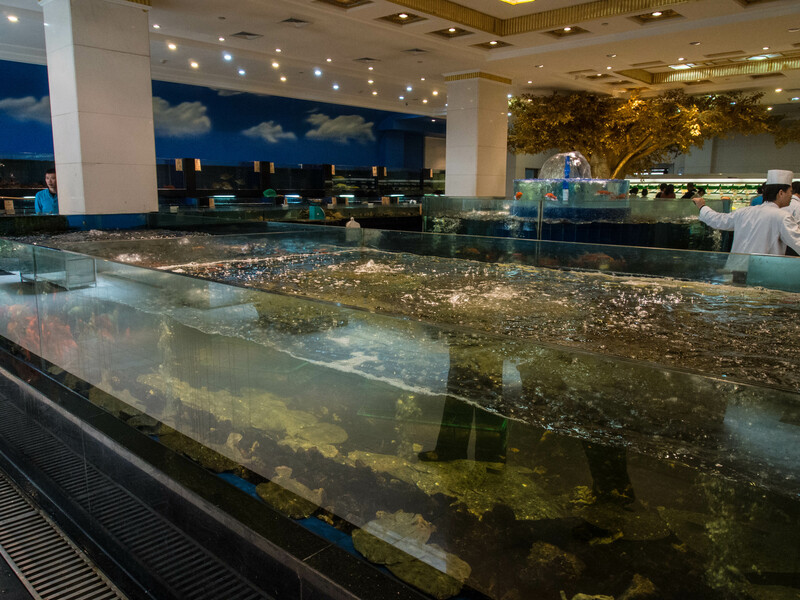 For lunch they took us to a fabulous seafood restaurant called 鹏天阁酒楼 péngtiāngé jiǔlóu. It was a large, well decorated restaurant. 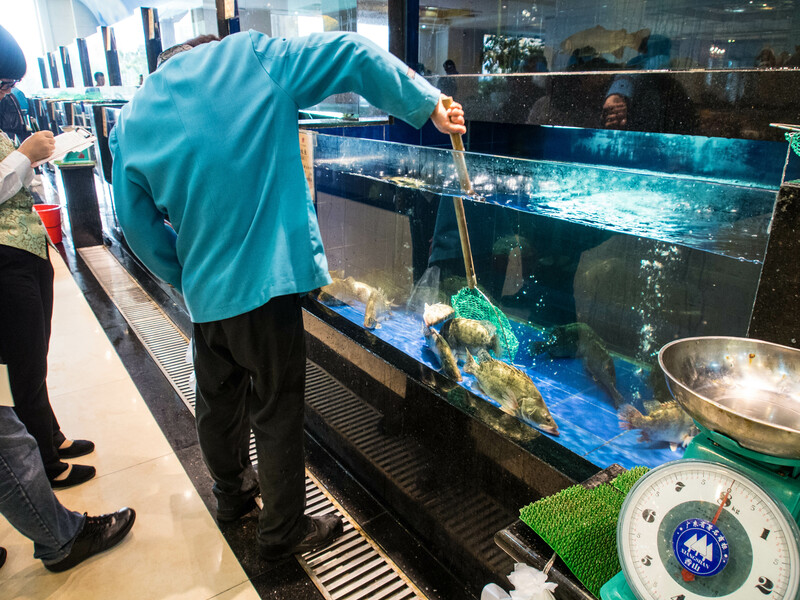 On the ground floor were dozen of large fish tanks full of turtles, lobster, shrimp, all kinds of fish, and so on. There was also many varieties of fish and other seafood on ice. 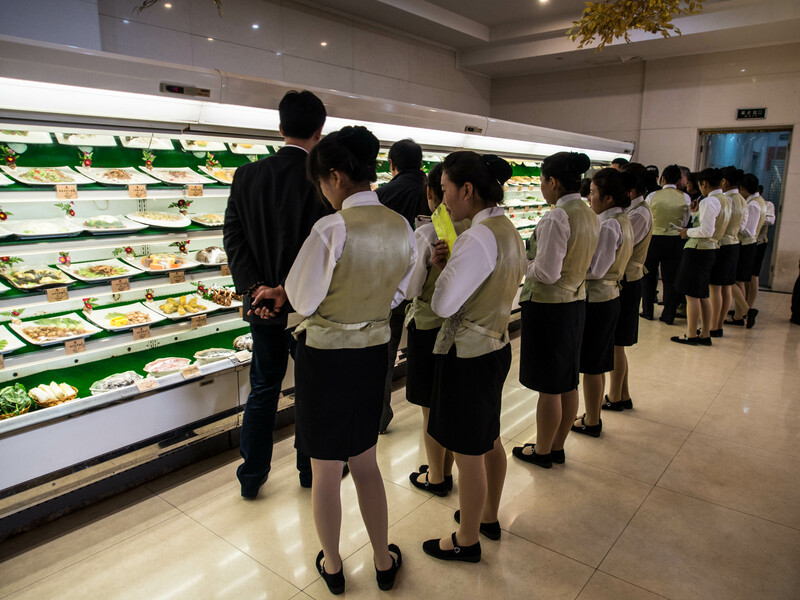 There were also refrigerated cases full of side dishes. The way these kinds of restaurants work is you walk around, followed by a hostess, and you tell her what you want. You even select the specific fish you would like to eat. They write everything down, and in some cases, net the seafood right there on the spot for you. After we selected our dishes we were ushered upstairs to a private dinning room. At most nicer restaurants it is common for larger private parties to have your own private dinning room. You will usually have a waitress assigned specifically to your room. The Chinese are gracious hosts. I had worked with this graduate student for several years, had hired her, wrote letters of recommendation for her, and so on. Her parents were probably feeling somewhat indebted to me, so this their way of saying ‘thank you.’ As is usual in this kind of situation, they ordered way more food than we could eat. This is also the Chinese way of showing respect for a guest. In total they ordered 11 dishes. Some of those dishes are below. Chinese restaurant food have notoriously creative names and they are difficult to translate. I have provided more literal translations to these dishes and sometimes have avoided the more difficult to translate phrases. It was a really memorable meal. 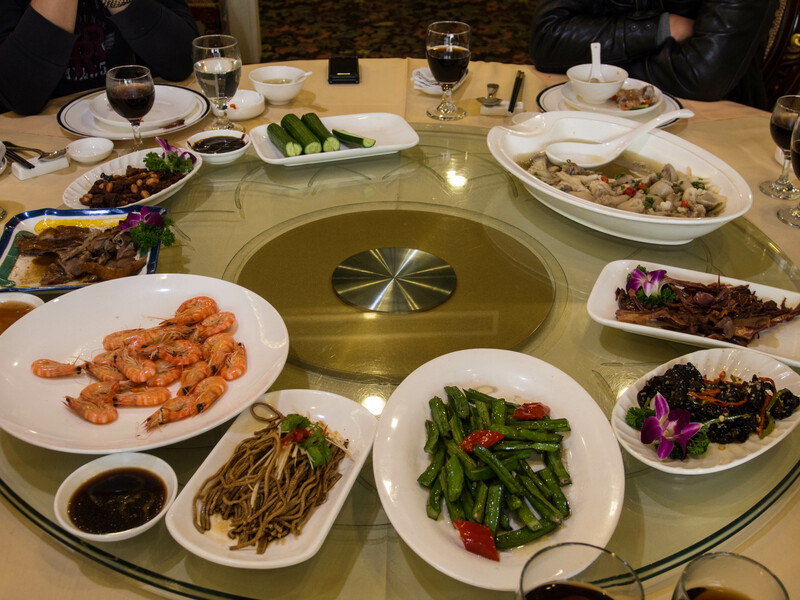 Chinese dining is a group experience with all dishes placed in the center of the table on a lazy Susan. Everyone then serves themselves from these dishes. Everything is communal. It is great to eat wonderful food with good company. And I quite liked the city of Tianjin. 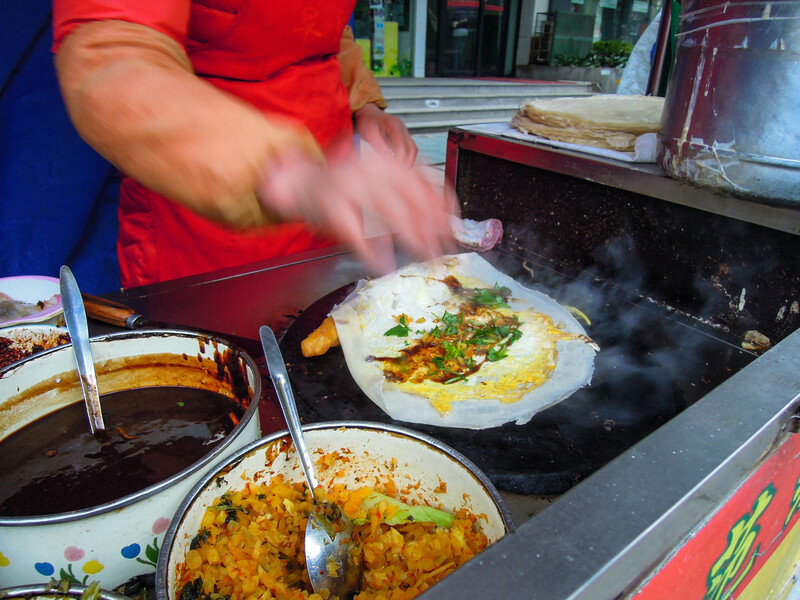 I love Chinese breakfast food, especially what you get on the streets, such as 煎饼 jiānbing. A few months ago I was in Beijing with some good friends and they took me to a simple little restaurant for breakfast. Nothing special, but nonetheless delicious. This is pretty typical fare for breakfast in the North of China. That morning we had 素包子 sù bāozi (vegetarian teamed dumplings), 油条 yóutiáo (fried bread sticks), 蒸饺 zhēngjiǎo (steamed meat dumplings), and hot 豆浆 dòujiāng (soybean milk). 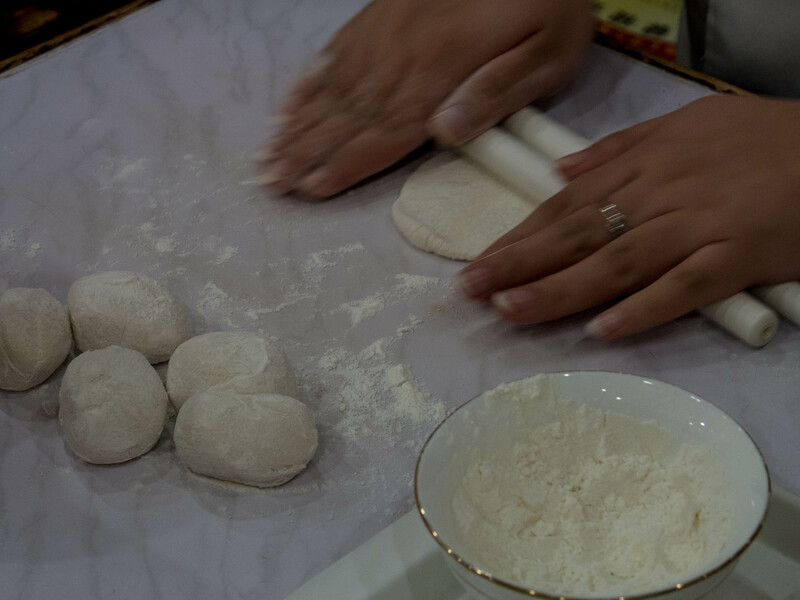 包子 bāozi is a generic term for steamed bread. They can be simply steamed bread with no filling or they can come with a variety of fillings. Vegetarian ones usually have spinach, mushrooms, and a number of other kinds of vegetables. Meat fillings are usually pork and seasoned with ginger, garlic, and will often have scallions, or mushrooms. They differ by region as well. You can find 油条 yóutiáo all over China. They are commonly eaten for breakfast, either alone, or as part of another dish. For example, 煎饼 jiānbing will often have a 油条 inside. 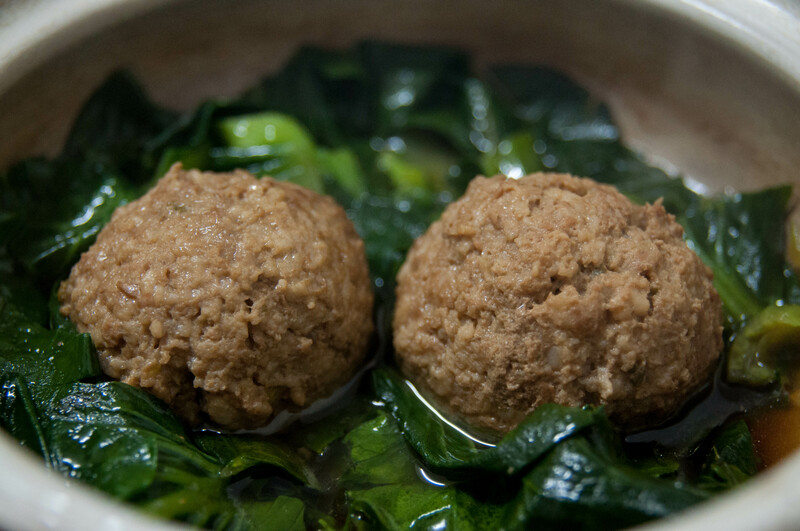 It is often eaten with 粥 zhōu in the south. Sometimes it is cut up into chunks and tossed into the 粥 zhōu sort of like croutons. 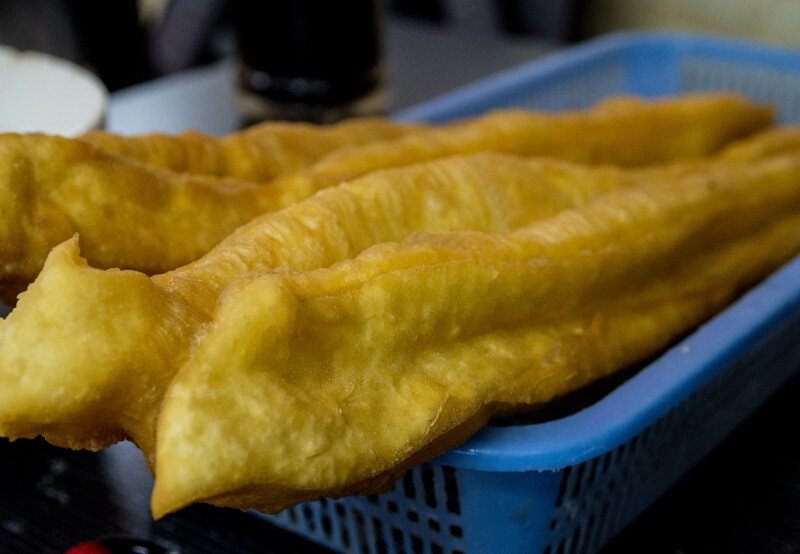 蒸饺 zhēngjiǎo are a variety of 饺子 jiǎozi that are steamed instead of boiled or fried. They usually have a meat filling. These also vary by region but are all pretty similar. 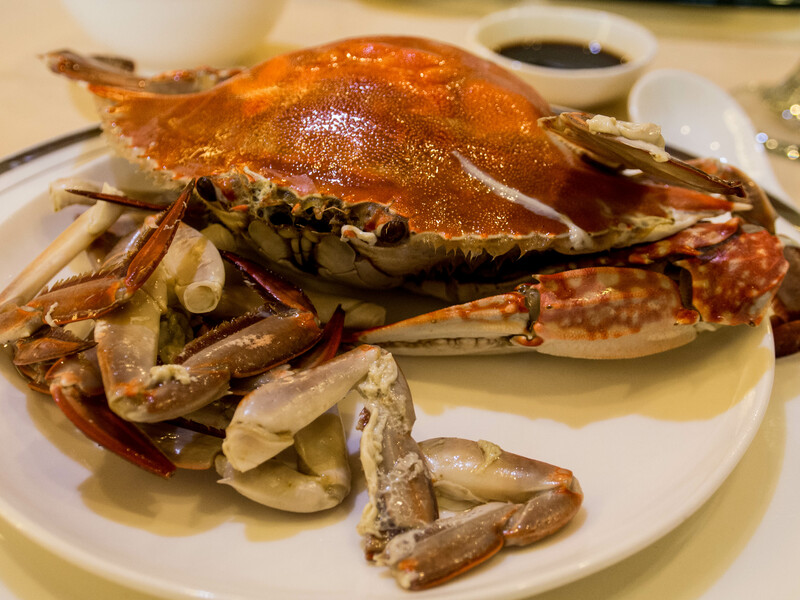 are a variety of 饺子 that are steamed instead of boiled or fried. They usually have a meat filling. These also vary by region but are all pretty similar. 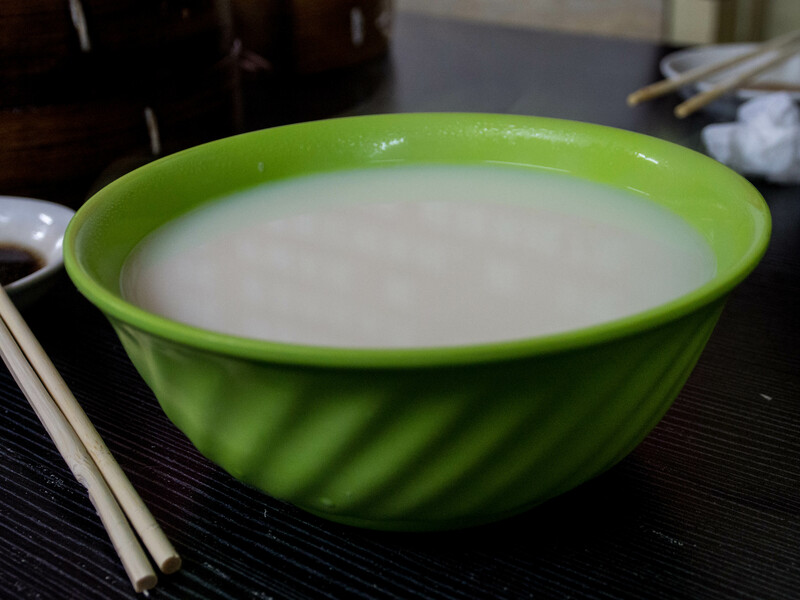 豆浆 dòujiāng is simply soy milk, but is often very fresh. In the Winter it is usually served hot in a bowl, like in the photo. It is a great way to warm up in the morning. Below are a couple photos of 油条 yóutiáo in 煎饼 jiānbing. In the first photo you can see it just under the 煎饼 and in the second photo it is rolled up in it. Dunlop, Fuchsia. 2008. 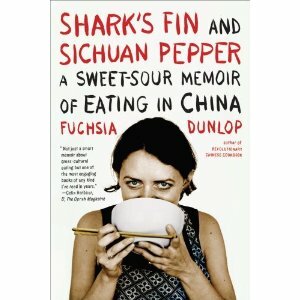 Shark’s Fin and Sichuan Pepper: A Sweet-Sour Memoir of Eating in China. New York & London: W.W. Norton & Company. First off I should say that I love eating in China. In fact, that is what I most look forward to when I am heading to China. 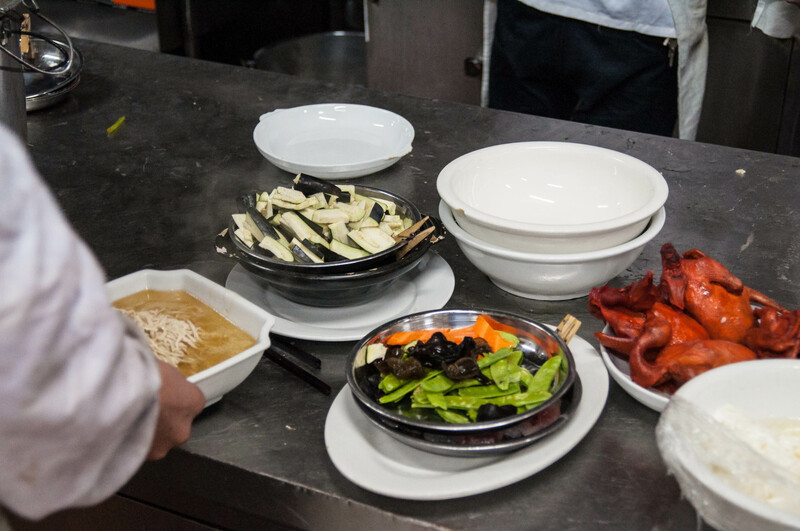 The variety and quality of the various cuisines in China is truly extraordinary. I really related to this book, not only for the eating adventures, but also because I also was once a young student in China trying to figure things out around me. Dunlop was a young girl studying Chinese in Chengdu when she became distracted by the heady smells and tastes that surrounded her. 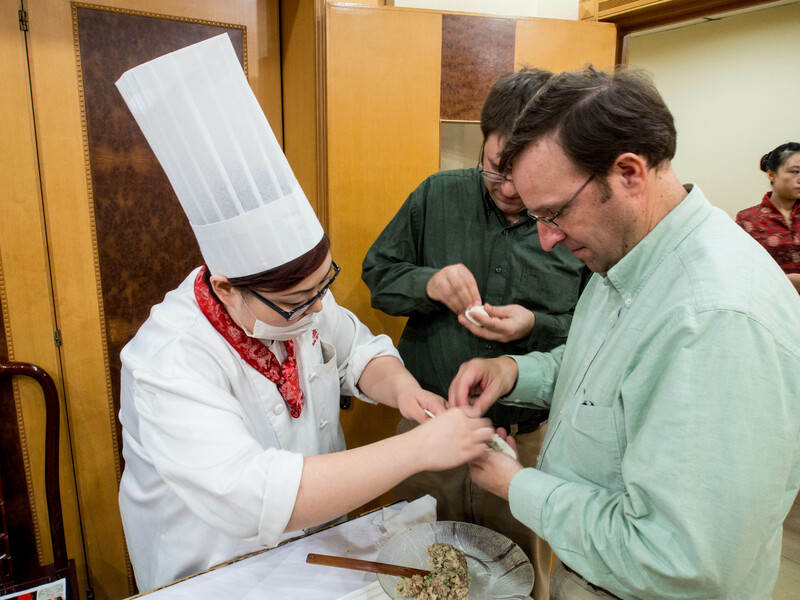 She enrolled in the local cooking school and dove headfirst into the wonderful world of Chinese cuisine, specifically 川菜 chuāncài, or Sichuan cooking, in her case. What makes this book so readable, and persuasive, is Dunlop’s ability to engage the reader with personal and intimate stories of regular people and homestyle cooking. As a speaker of Chinese she is able to share experiences with ordinary Chinese that would not be possible without a knowledge of the language. For example, she befriends the cook at the local noodle shop and eventually persuades him to give her the recipe for his famous dandan noodles, which she shares with the reader. I know I have said this before in other book reviews, but knowing Chinese really opens up all kinds of doors and allows one to experience a China that would not be possible if you did not know the language. She correctly states on page 206, “Food has always been of exceptional importance in Chinese culture. It is not only the currency of medicine, but of religion and sacrifice, love and kinship, business relationships, bribery, and even, on occasion, espionage. ‘To the people, food is heaven,’ goes the oft-repeated saying.” Though the book focusses on Sichuan cuisine, she does give insight into China’s other culinary traditions as well. The book is engaging, entertaining, and very informative. It is obvious that she has done her homework and knows her stuff. She gets added credibility because she experiences all this first hand while she lived in China and on subsequent trips back after returning to the UK. The reader comes away from this book fascinated with Chinese food, and really hungry. The food she describes is the real thing. This is a well written memoir and I highly recommend it. 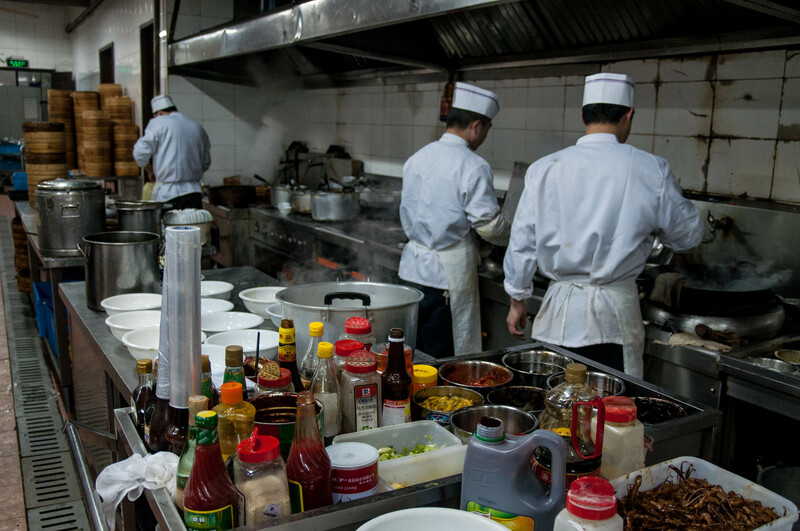 As much as I love to eat Chinese food, I had never really been into the kitchen of a big restaurant. Small restaurants, sure, you can hardly not see the kitchen. I joke with my students (with a serious undertone), to not look back into the kitchen at a Chinese restaurant. Just enjoy the food and don’t worry about where it came from. 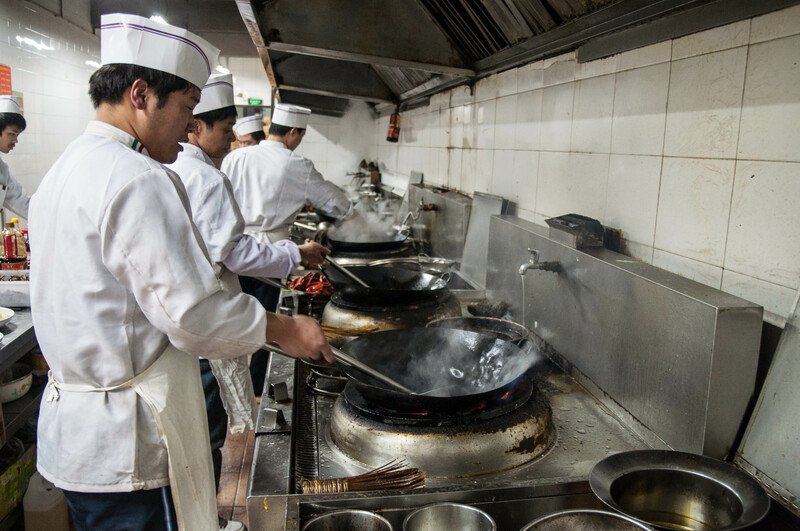 Chinese kitchens may not be the model of sanitary practices. 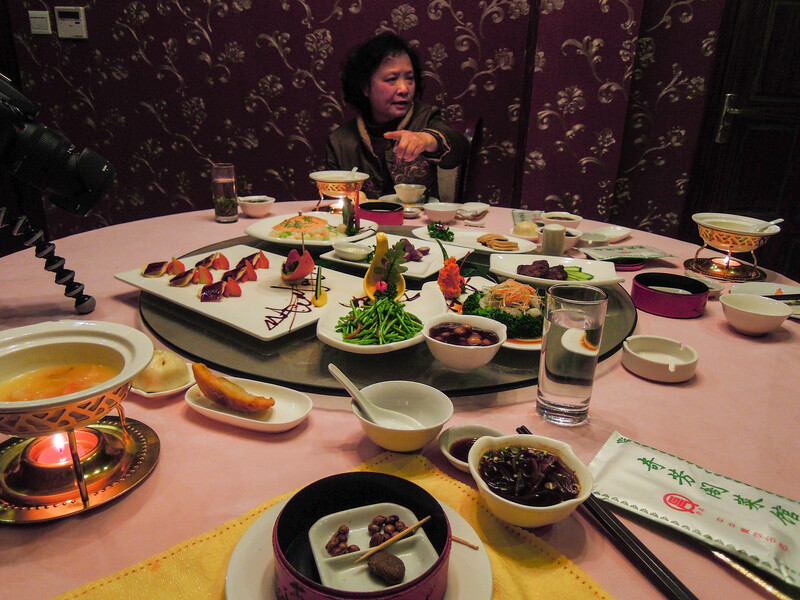 Last year I was visiting with an old friend in Nanjing, and as usual he and his wife invited me out to eat. He is a 23rd generation Chinese Muslim and is very well connected with the Muslim community in Nanjing. He knows all the best Muslim restaurants and has a personal relationship with all the owners. 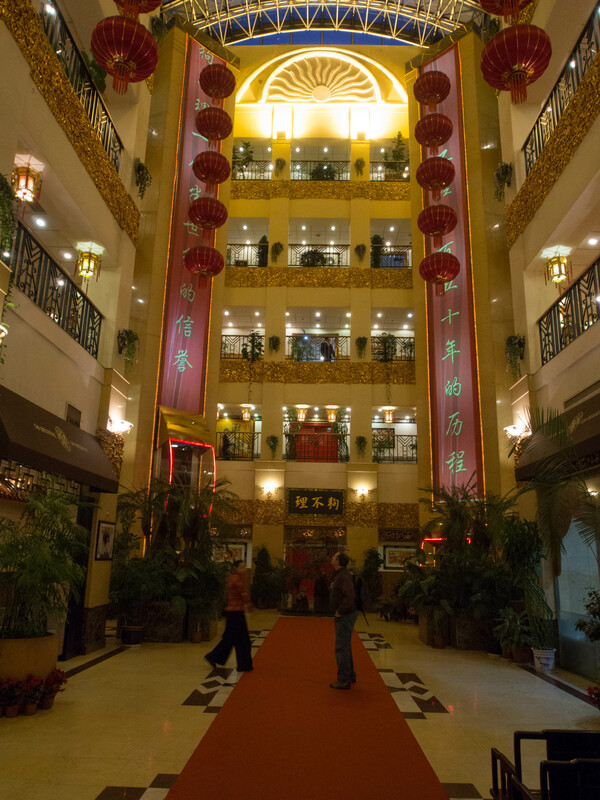 On this occasion we ate at the excellent 奇芳阁 qífānggé restaurant at Fuzi Miao fūzi miào in the southern part of the city. 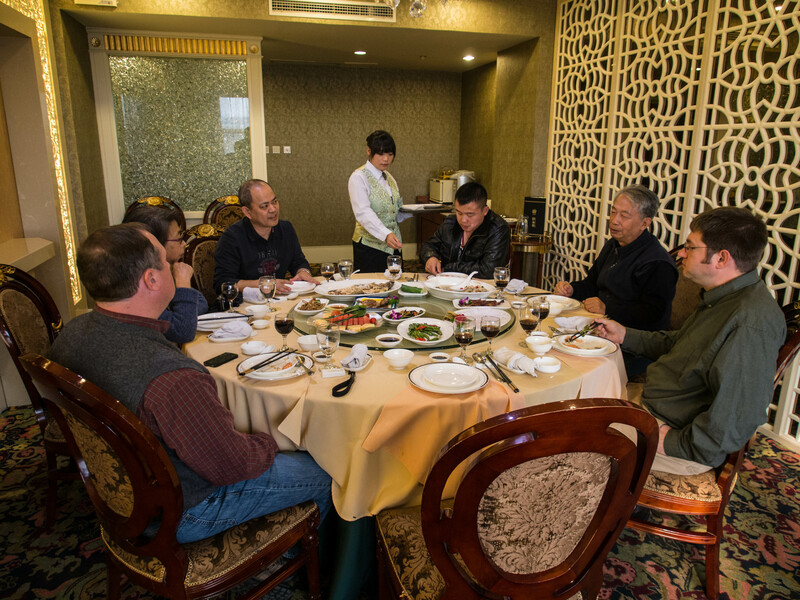 This restaurant has a long history and offers excellent Muslim Chinese food. (More on Muslim food in China in another post). Knowing my interest in Chinese food and culinary culture, my friend introduced me to the head manager of the restaurant as well as the head chef. They then gave me a tour of the kitchen and graciously allowed me to take photos. The lighting was not good, and I struggled to get good exposures, so the photos are not great. But I think they are interesting. 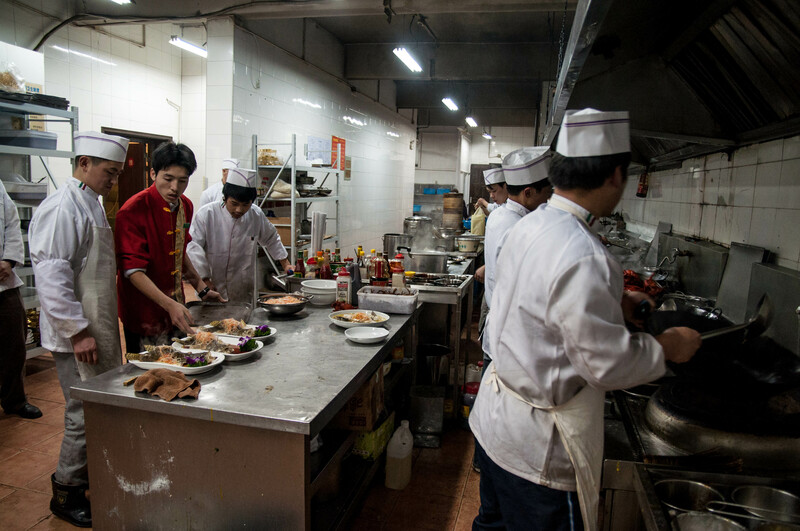 I suppose the kitchen was not too different from any restaurant kitchen—busy, loud, and a bit chaotic at times with waiters and waitresses coming and going. In my last post I posted a photo of Tianjin’s famous 狗不理包 gǒubùlǐ bāo. I then received a comment about this very unusual name for this steamed dumpling. As the commenter noted, it sounds like these 包子bāozi are not even fit for dogs. For the non-Chinese speaking readers, let me explain. 狗 gǒu simple means ‘dog’ and to 不理 bùlǐ means to ‘pay no attention to,’ so a literal translation would be something like ‘the dumpling that dogs won’t pay attention to.” This would imply that they are not too tasty. Before going to Tianjin last Autumn I had never tasted them, though I had heard of them as they are considered a famous Tianjin snack. 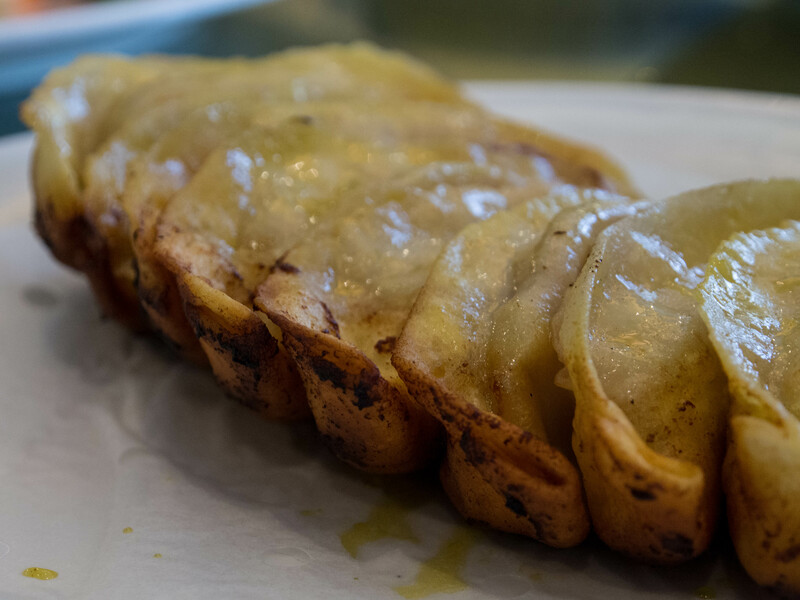 Here is the story about these very tasty dumplings. It comes from the book 旅游城市美食指南：便走便吃 edited by 周国宝. (Tourist City Guide to Gourmet Food: Eating While Traveling). According to tradition, the story begins in 1858 when a 14 year old boy named Gao Guiyou arrived in Tianjin. His nickname was Gouzi (狗子 gǒuzi) or ‘dog.’ He had come to Tianjin to study to be a craftsman. He was very clever, good with his hands, and a quick learner. 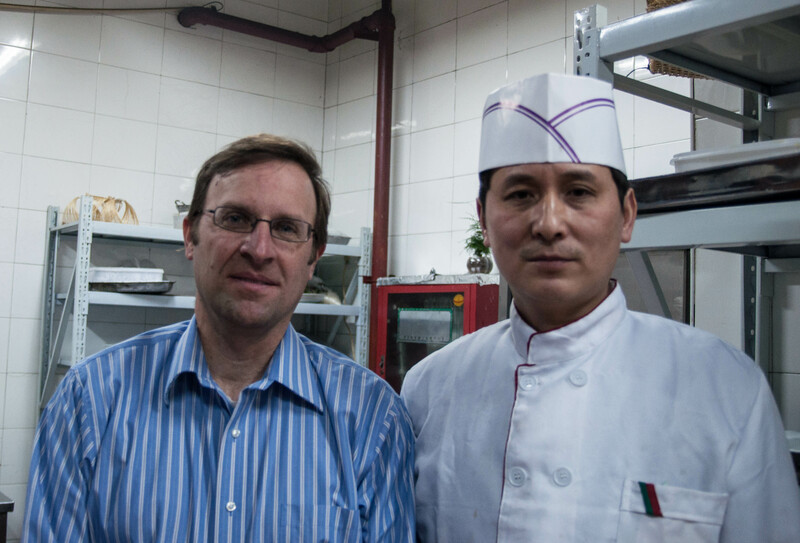 He apprenticed at a shop run by the Liu Family that made steamed dumplings (包子 bāozi). He learned very quickly how to make beautiful and delicious dumplings. After three years he had served out his apprenticeship and opened his own shop selling his own dumplings. He soon gained a reputation for making the best dumplings in town and people came from all over to eat them. 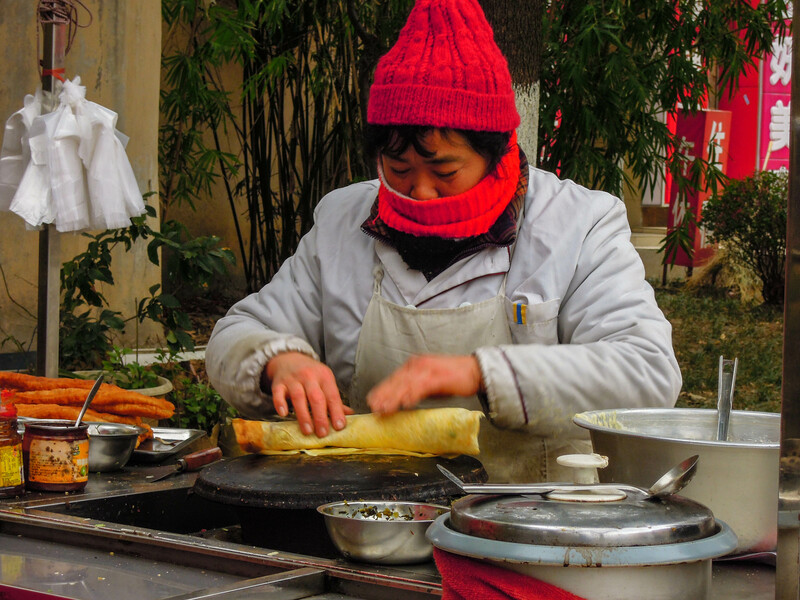 He became so busy that he had no time to talk to his customers, thus the phrase, 狗子卖包子，不理人, gǒuzi mài bāozi, bùlǐ rén, ‘Gouzi sells dumplings and doesn’t pay attention to people (meaning his customers). After awhile people began calling him 狗不理 gǒubùlǐ, and his famous dumplings became known as 狗不理包 gǒubùlǐ bāo. Now it is said that if you travel to Tianjin and don’t try 狗不理包子 gǒubùlǐ bāozi, then you’ve never been to Tianjin. Me and a couple friends/colleagues traveled to Tianjin to visit the parents of a former graduate student I worked with. It was also a good excuse to visit Tianjin. We took the new bullet train from Beijing and it only too 28 minutes to get to Tianjin. They took us out to eat at the famous 狗不理大酒店. Whether this was the original location of the shop in the story, I don’t know. We had an excellent meal which of course included gǒubùlǐ bāo. I am happy to report that they are delicious. We had a chef come into our private room and demonstrate how to wrap them. She then taught us how to do it. Though it may look easy, it surely is not and takes a great deal of practice to wrap them properly. Can you tell which one the lǎowài (foreigner) wrapped? Finally, here is a short video I shot of the chef wrapping a 狗不理包. She makes it look so easy and effortless, but I assure you it is not. As I said, they are truly delicious. 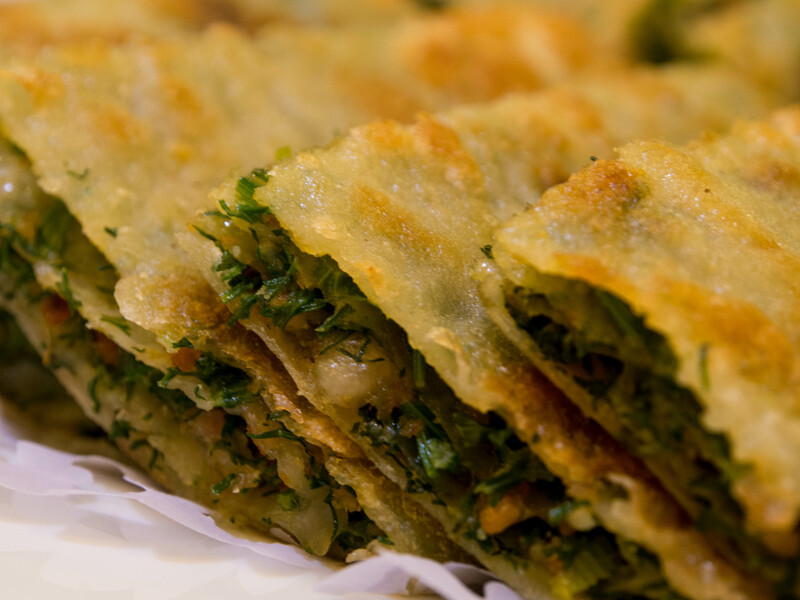 Next time you are in Tianjin, make sure to eat some 狗不理包. 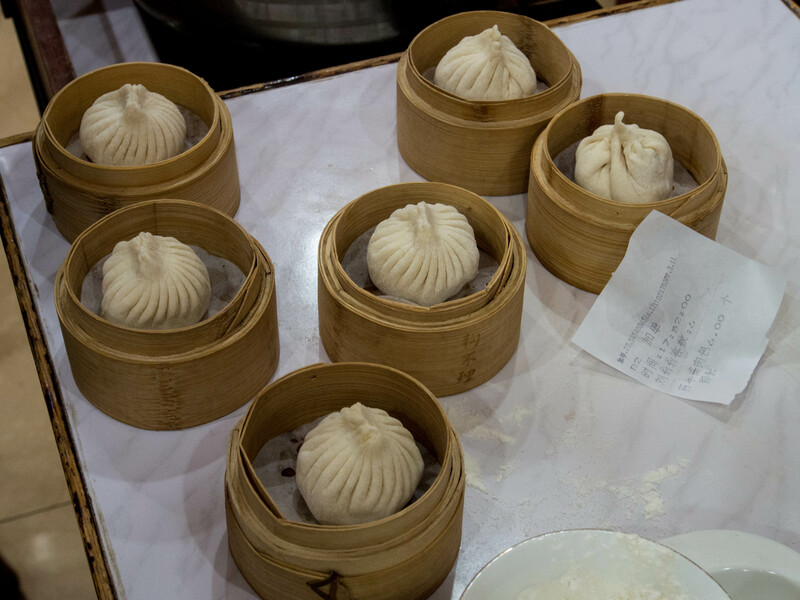 Dumplings have been around for a long time in China. They are perhaps China’s original fast food. Dumplings come in a variety of different styles. 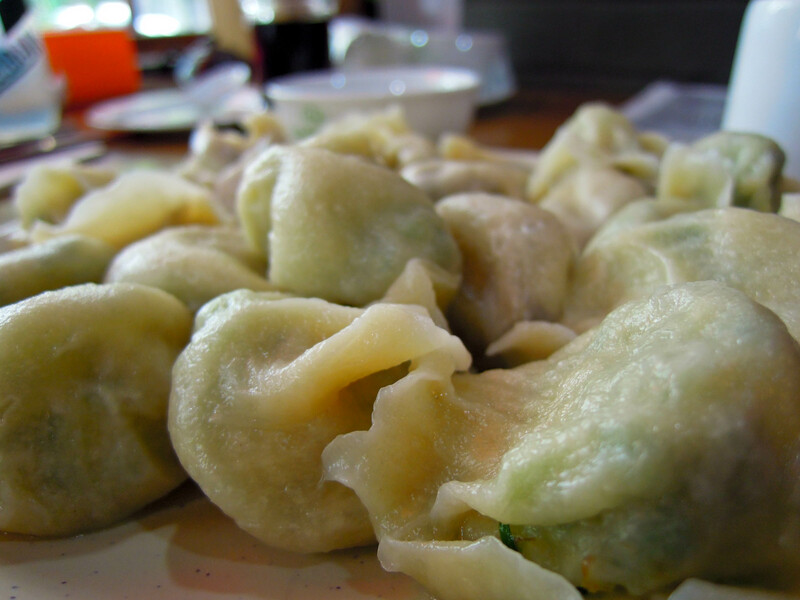 饺子 jiǎozi is generic name for dumplings. 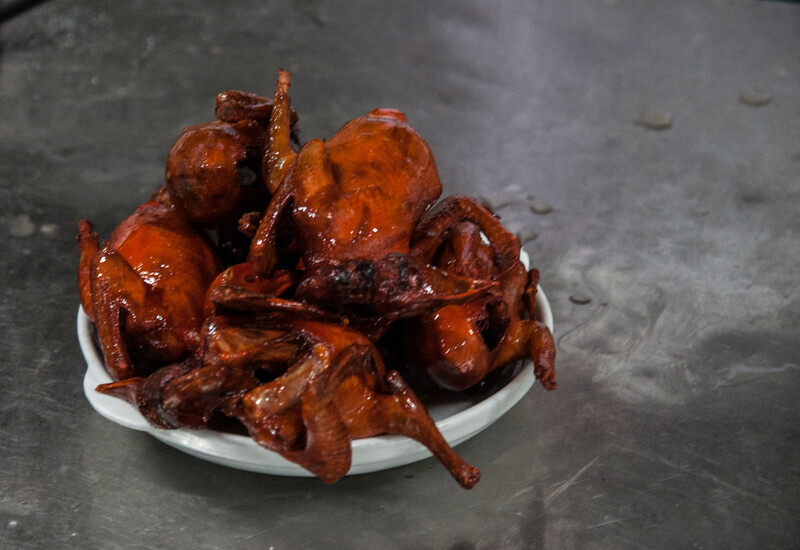 Traditionally they are eaten in the North of China, but really can be found all over as well. 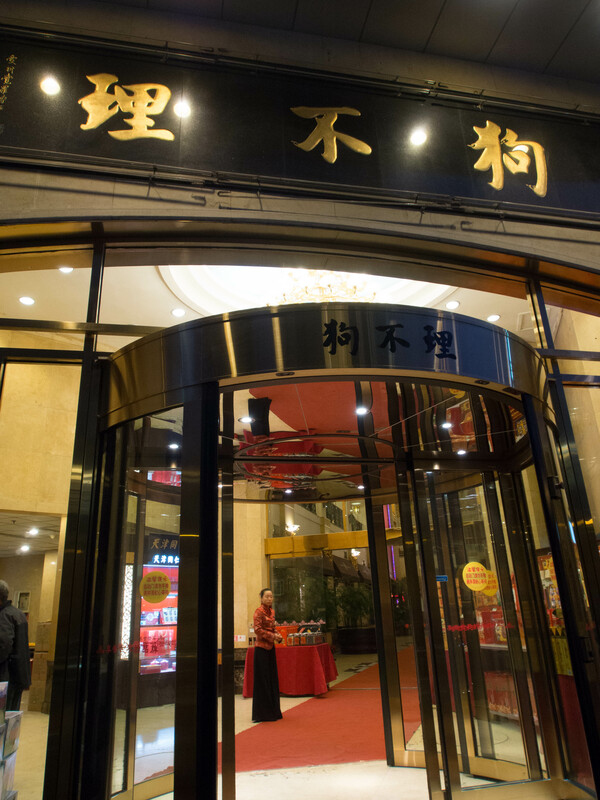 In fact, there are chain restaurants all over China that serve nothing but shuǐjiǎo, such as the popular Chain 大娘水饺 dàniǎng shuǐjiǎo (http://www.cnddr.com/eng/index.htm). They are also traditionally eaten during Chinese New Year. Boiled jiǎozi, how they are typically eaten in the North and very popular in Beijing, are called 水饺 shuǐjiǎo. They are usually sold by weight, the 两 liǎng, which is 50 grams. The plate above has 2 liǎng. Earlier this year I was wondering around north of the Forbidden City in Beijing, near the old Drum Tower, and found a wonderful small restaurant that served dozens of varieties of shuǐjiǎo. At this particular restaurant they had pork, beef, lamb, and egg shuǐjiǎo with dozens of varieties of each. 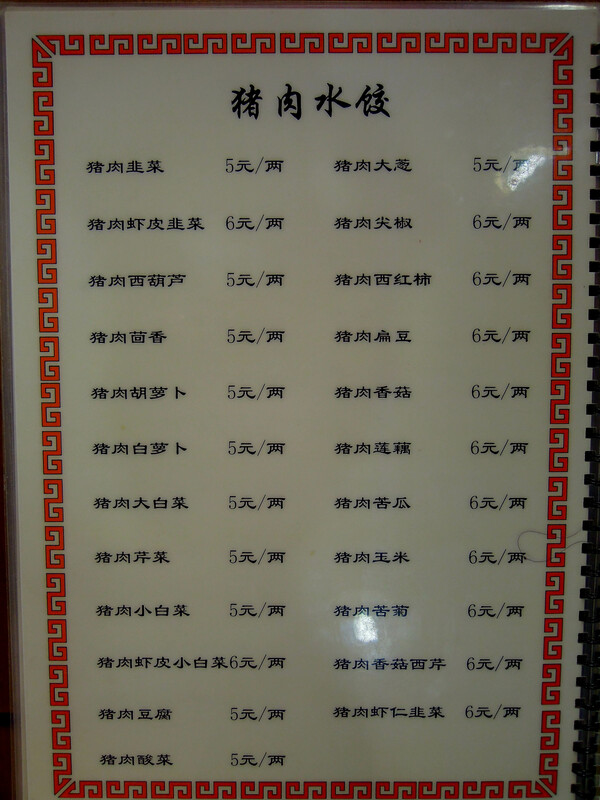 Below is a shot from the pork shuǐjiǎo page of the menu. You can choose from pork with chives, cabbage, fennel, carrots, turnips, mushrooms, onions, peppers, to name a few. The skins are homemade (of course) are sometimes thick and chewy, and sometimes thin and almost transparent. They are usually dipped in a dark, rich vinegar. 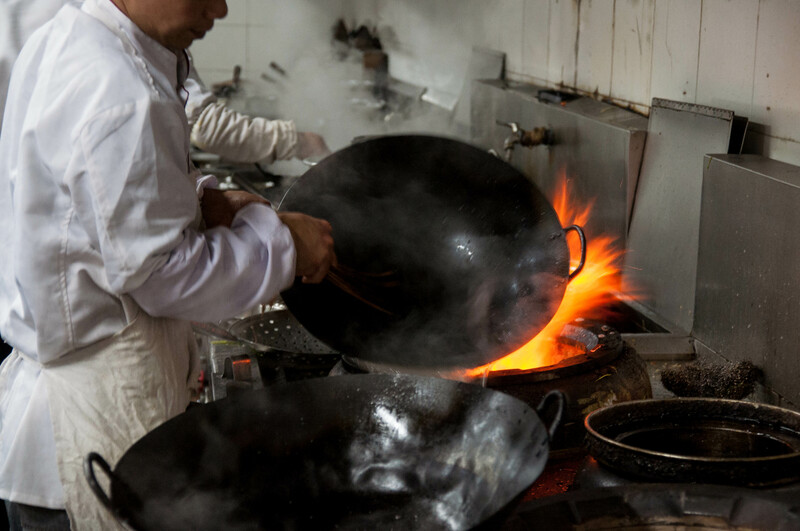 In some parts of China, usually farther south, the vinegar is mixed with a little soy sauce. In some areas they add chili oil as well. 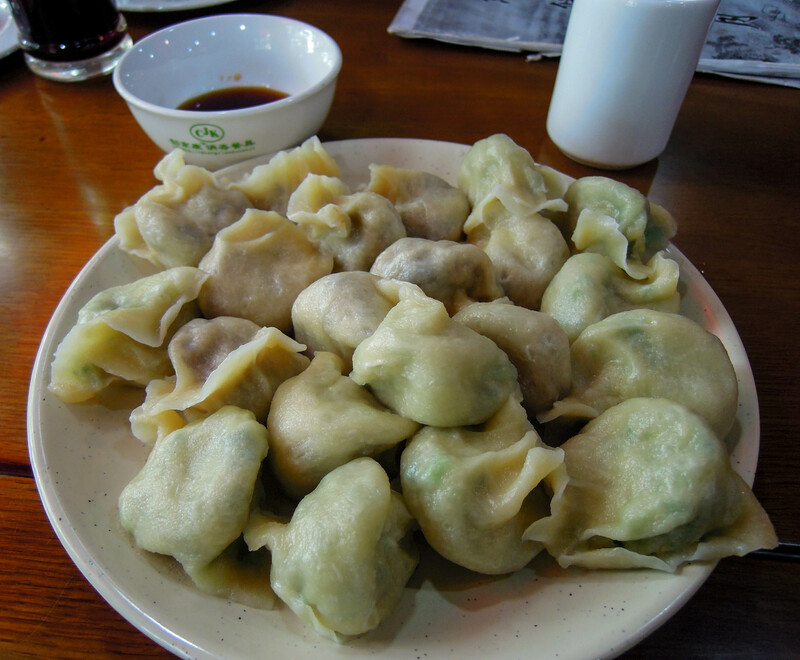 Jiǎozi can be a meal all by themselves, and are also often served at the end of a banquet. 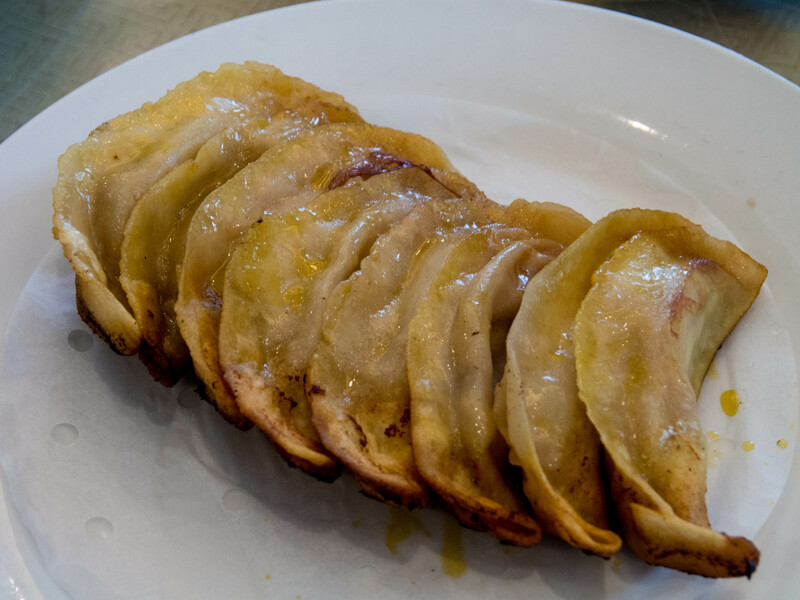 Another wonderful variety of jiǎozi are pot stickers 锅贴 guōtiē. 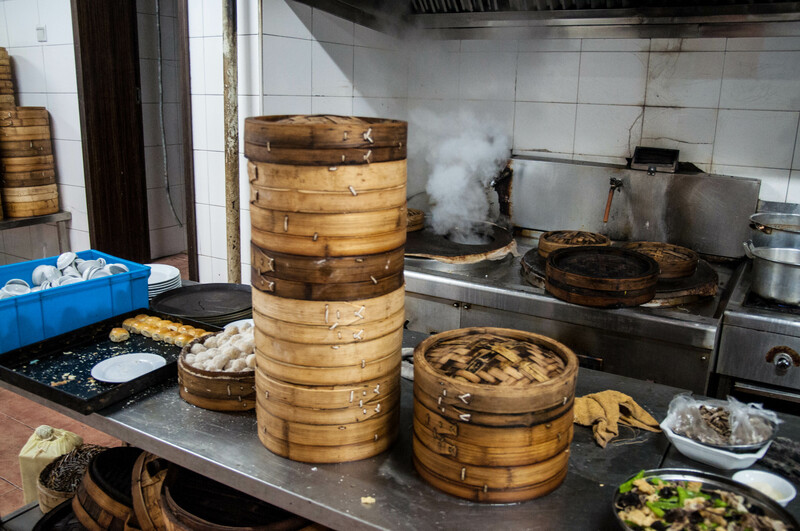 These dumplings are fried in a flat wok with oil until they are crispy on the bottom, then water or broth is added and a lid put on and steamed until done. 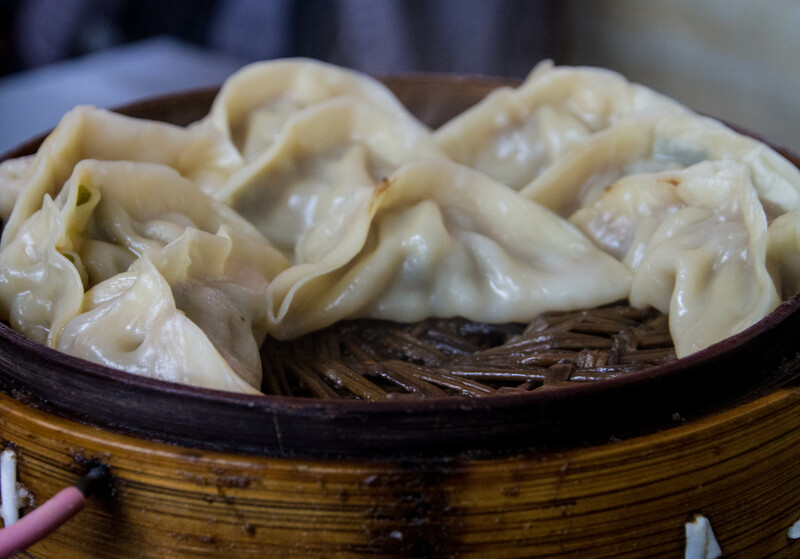 When I was in China for the first time as a student at Nanjing University in 1985, pot stickers were about the only food we could find outside of large state-run restaurants and the school cafeteria. I loved them back then and I still love them and eat them every time I go to China. The potstickers below were ordered at a Muslim restaurant last month in Nanjing as part of a larger lunch. The bottoms are fried crispy in oil. 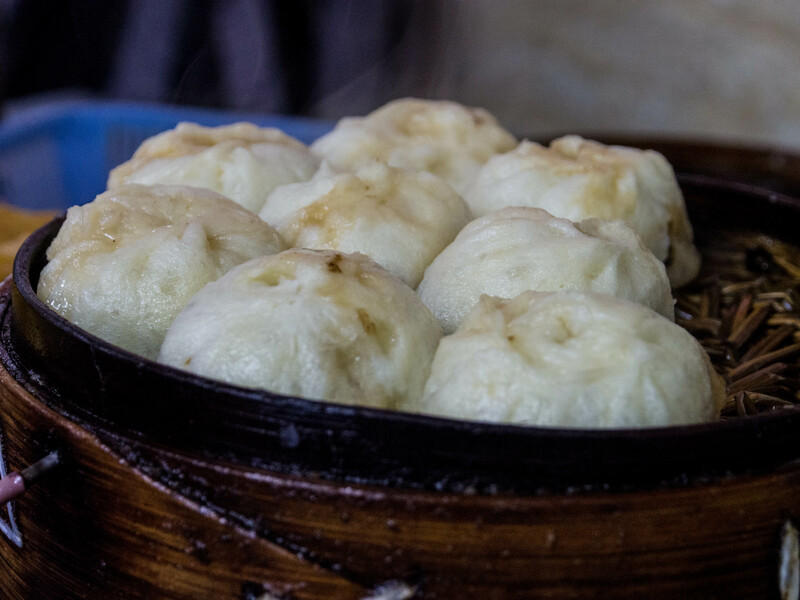 Any traveler to China must eat a good plate of dumplings. The good news is that you should be able to find them all over China. 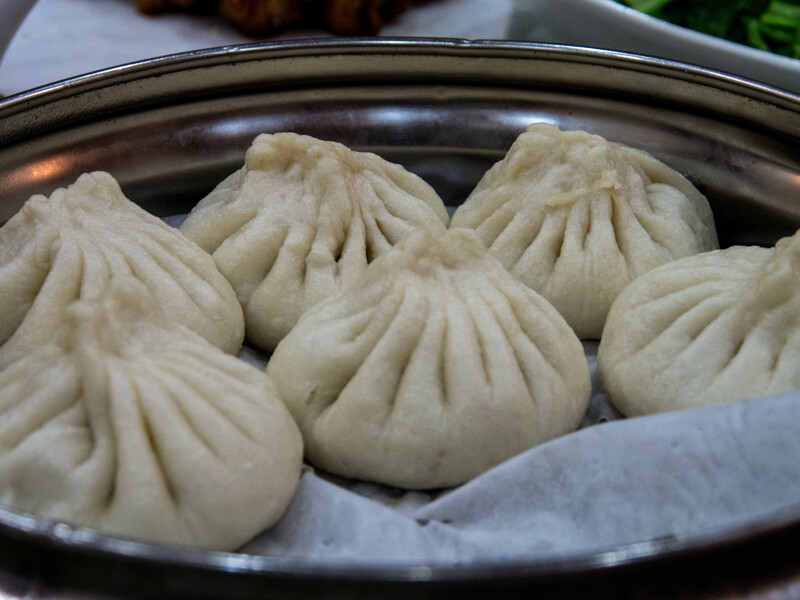 You can order them in fancy, expensive restaurants, small nondescript restaurants, chain restaurants that specialize in dumplings, and and even on the street. The city of Yangzhou sits on the Northern banks of the Yangtze River (长江 chángjiāng) a short distance down river from Nanjing and a couple hours upriver from Shanghai. The city has approximately 4.5 million people and is often described as a quaint Chinese town or city. And guess what? It does feel smallish and quaint compared to China’s other massive, sprawling cities. 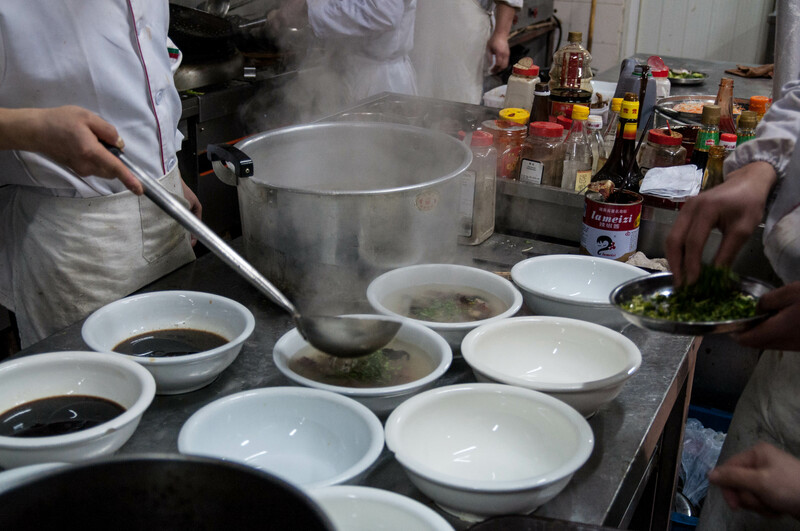 Yangzhou is a culinary hotspot. If you like to eat, you will love Yangzhou. 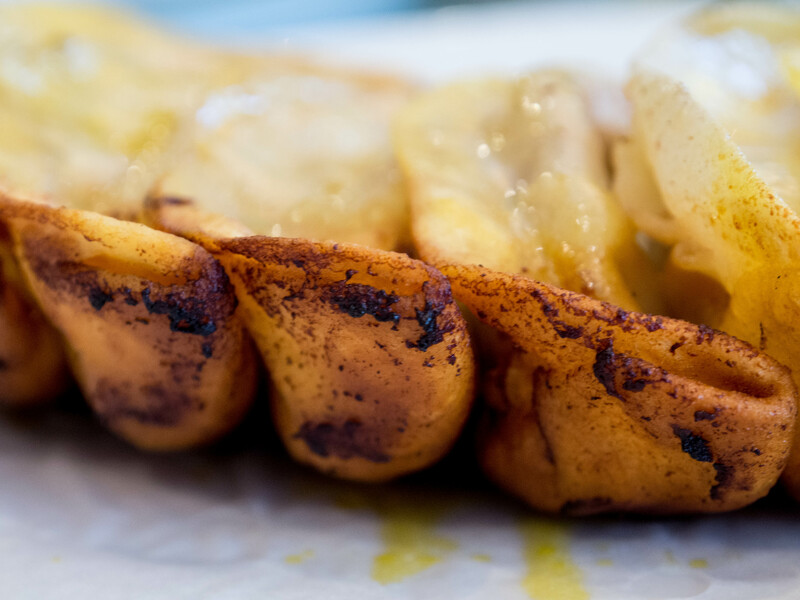 It is a foodie’s paradise. In an earlier post I talked about Yangzhou’s famous and fabulous dimsum. (https://intothemiddlekingdom.com/2012/06/29/yangzhou-dimsum/). Yangzhou is one of the culinary centers of Huaiyang cuisine (淮扬菜 huáiyáng cài), one of the Eight major cuisines in China (八大菜系 bādàcàixī). The name comes from the Huai and Yangtze Rivers that cut through this fertile region. The Yangtze River is also called in Chinese the 扬子江 yángzi jiāng. 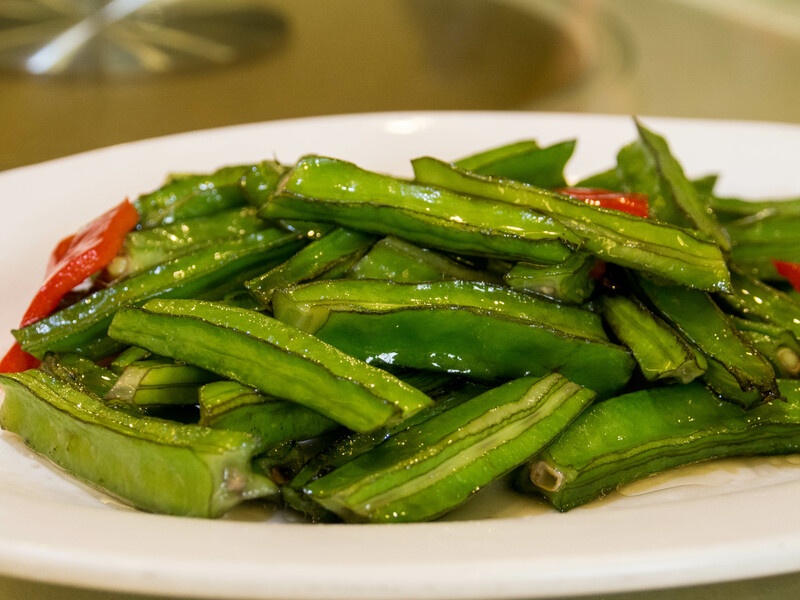 Huaiyang Cuisine is characterized by super fresh ingredients with delicate seasoning. It is felt that you don’t want to overpower the freshness of the ingredients with heavy sauces or spices. 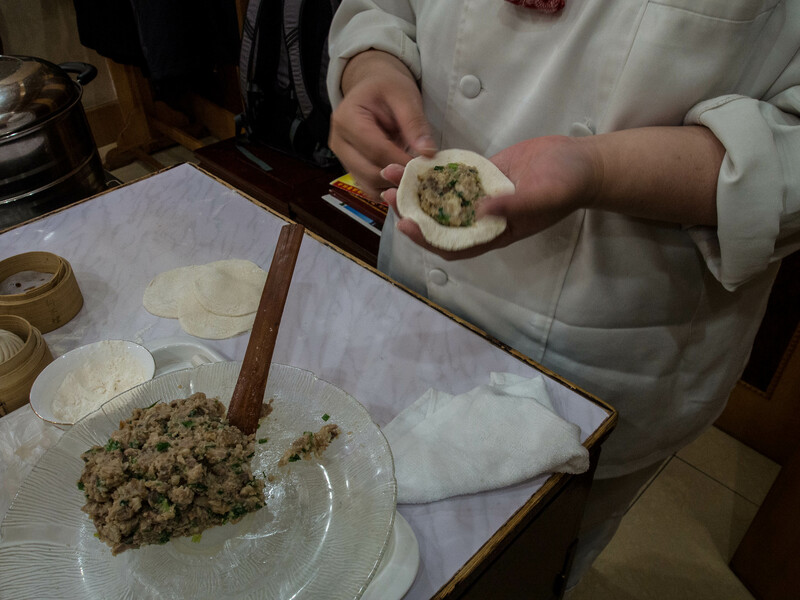 Along with Cantonese (粤菜 yuècài), Sichuan (川菜 chuāncài), and Northern (鲁菜 lǔcài) cuisines, Huaiyang Cuisine is highly celebrated in China and for good reason. 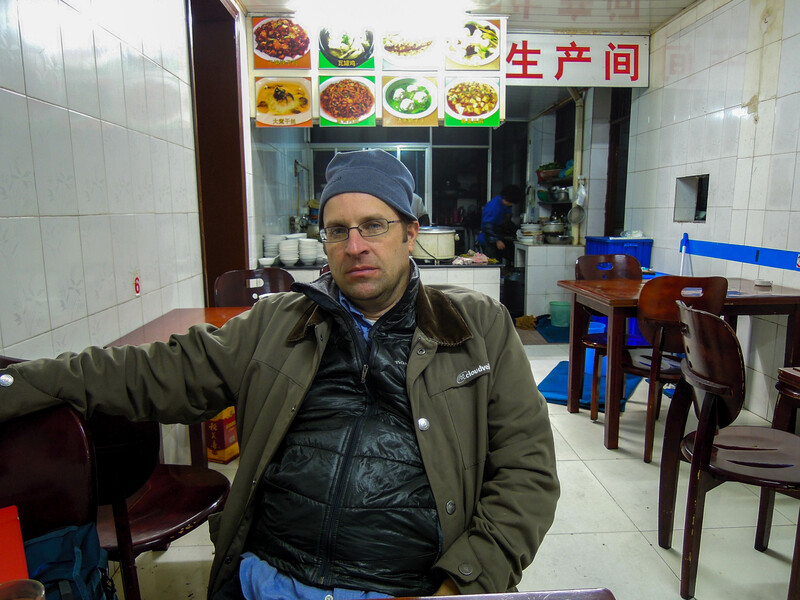 As I have mentioned in previous posts, I was in Yangzhou for a couple days in February of this year and sampled some of the famous dishes of the city. It was truly a memorable culinary experience. Fortunately, I have my friend, and colleague from Nanjing University, and fellow foodie along with me. He knows the city well as he spent much time there as a child visting his grandmother. One night we selected a small restaurant down an alley off a main street. 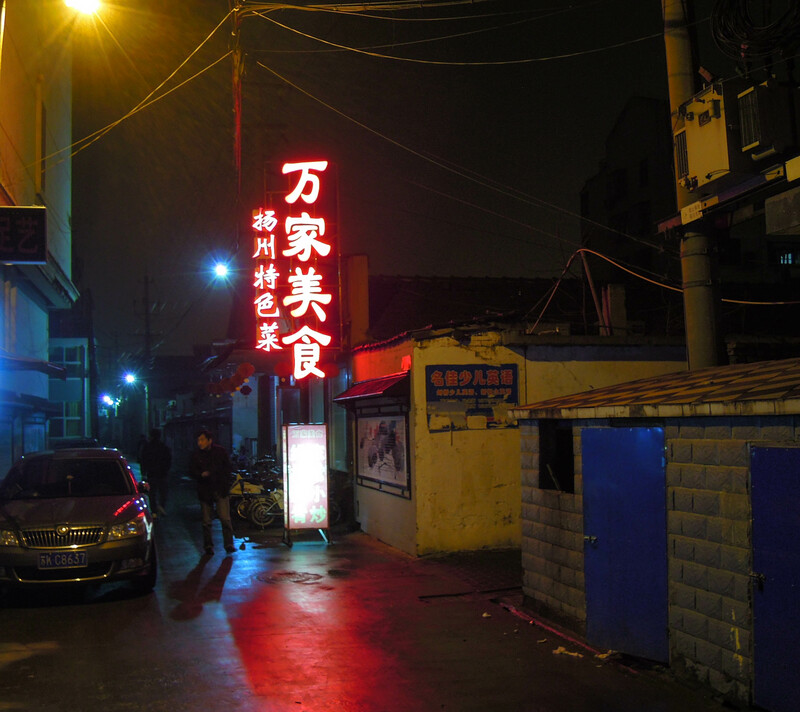 It is pictured above and was called 万家美食 wànjiā měishí and specialized in Yangzhou’s specialties which is what the smaller characters on the sign say, 扬州特色菜 yángzhōu tèsè cài. It was a cold rainy night, and as many of you know, there is seldom central heat in buildings in this part of China so you get used to eating with your coat and hat on. 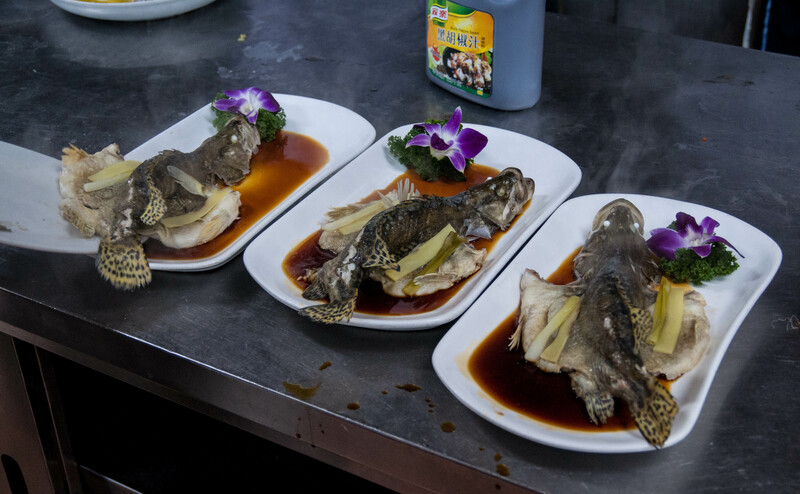 Yangzhou cuisine is famous for its “three heads” dishes. 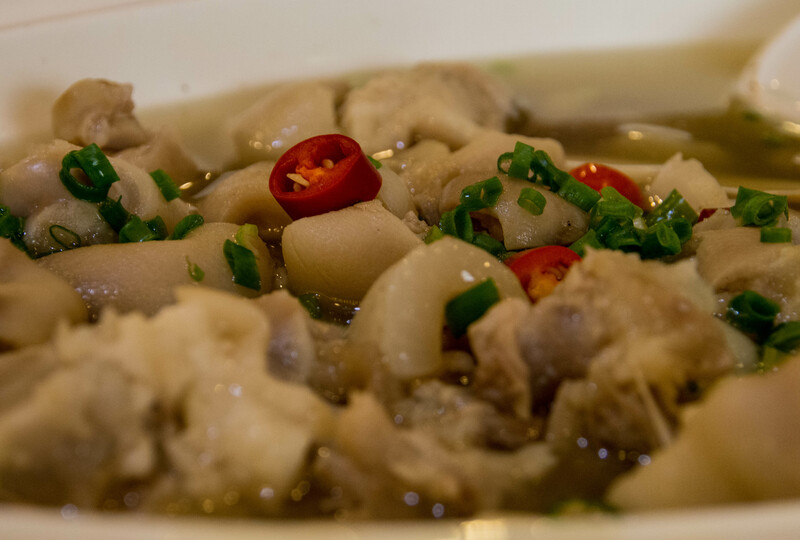 This includes fish head (鱼头 yǔtóu), lion’s head (狮子头 shīzitóu), and pig’s head (猪头 zhùtóu). I tried the first of the two, which were exceptional. The pig’s head is basically a braised pig face, which I decided to pass on. I know what many of you are thinking, fish head??? Trust me, it is delicious. The most tender and delicious meat from a fish comes from the cheek area, and the area just below the gills. Have you ever had halibut cheeks? I ate them once at a seafood restaurant in Seattle and they were to die for. 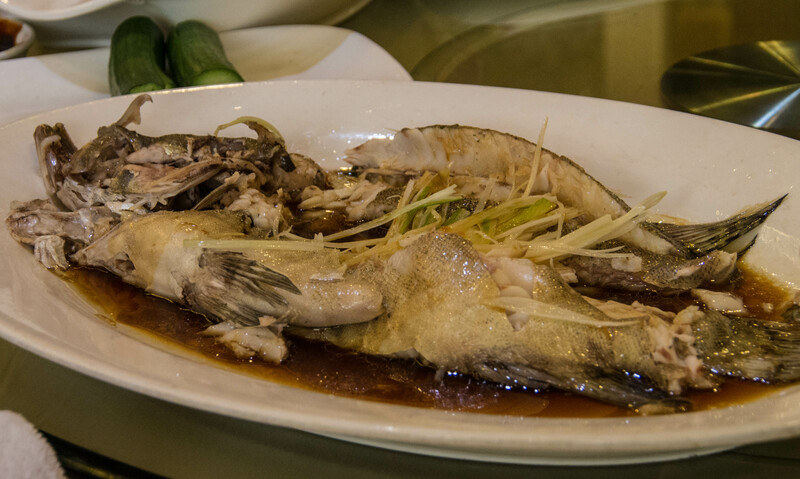 This fish dish was exceptionally fresh, with a delicate sweet and slightly sour sauce with a few chopped scallions sprinkled on top. It was really good. This dish contains no part of any lion. 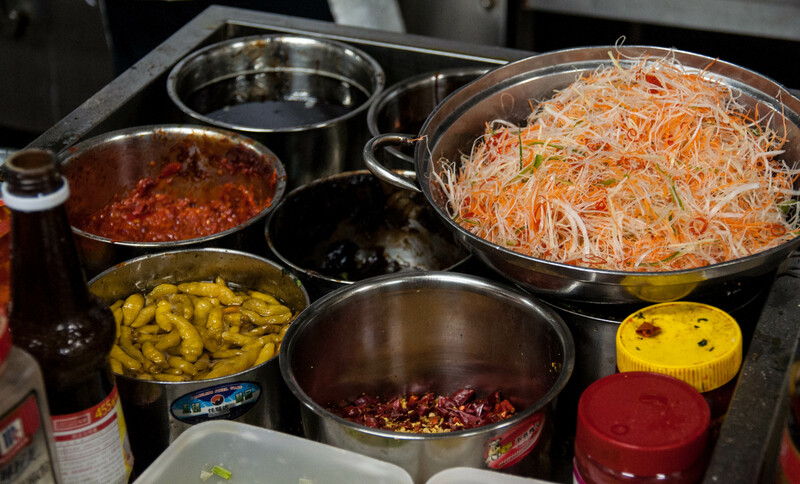 The Chinese have many creative names for dishes that have nothing to do with the ingredients. This dish is actually made with beef. However, it is not cheap ground beef. Prime cuts of beef are actually chopped with two large cleavers until the meat is minced into teeny tiny pieces. It is then seasoned with ginger and some onion, then steamed to perfection. The meat is so tender and succulent it can only be described as velvet-like. It was fantastic. The flavors were delicate, subtle, perfect. I really enjoyed this dish. It was ever better than the similar beef balls you get on Cantonese dimsum menus. I am not a big beef eater, but this dish was outstanding and I would order it again, and again. 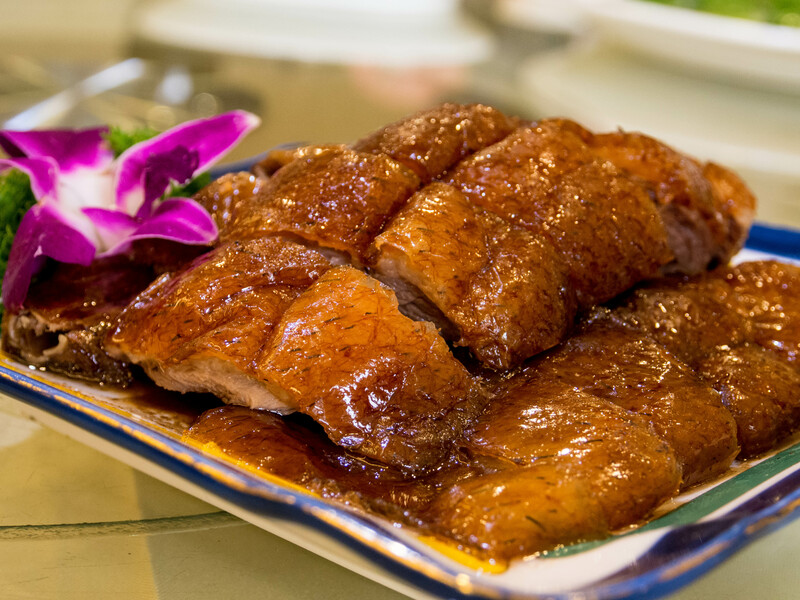 This is another famous Yangzhou dish. The noodle-looking things are actually a type of dried tofu called 豆腐干 dòufugān, which literally means “dry tofu.” It has a firm, chewy texture similar to noodles. Like all tofu dishes the tofu soaks up all the flavors it is mixed with. 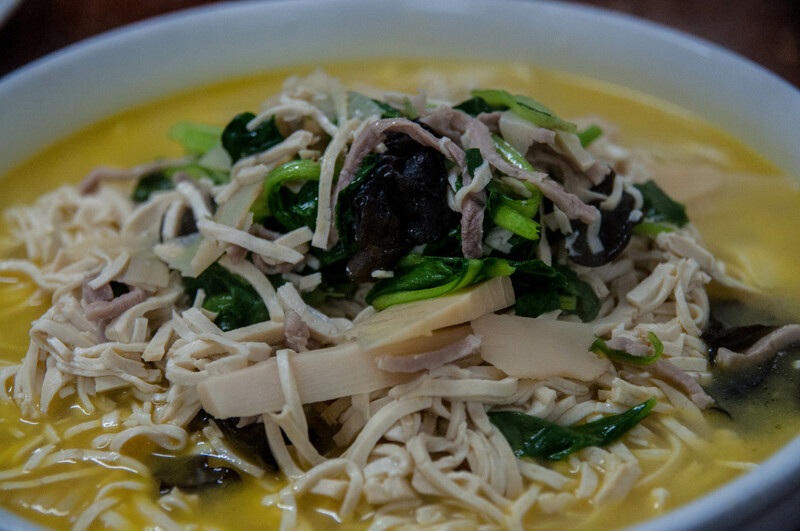 This dish contains some greens and bamboo shoots all cooked in a delicious, light chicken based stock. 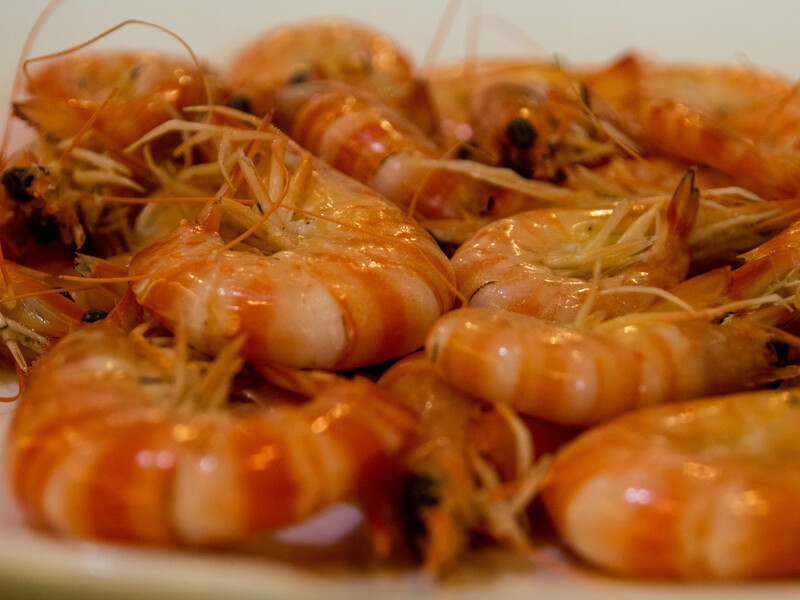 It is a wonderful dish and can be found all over Yangzhou. This is not the greasy slop that you get at Chinese-American restaurants in the U.S. The first time I encountered Yangzhou style fried rice I had just arrived in Guangzhou after many hours on a plane. I finally got to my hotel around midnight and I was ravenous, but way too tired to go out and find a restaurant still open. So I ordered a plate of Yangzhou fried rice from room service. It was delicious! 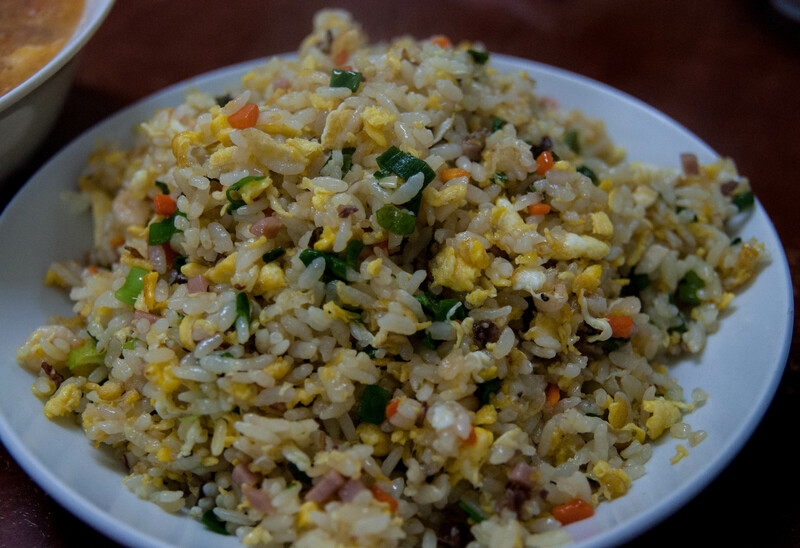 Yangzhou fried rice is famous all over China. 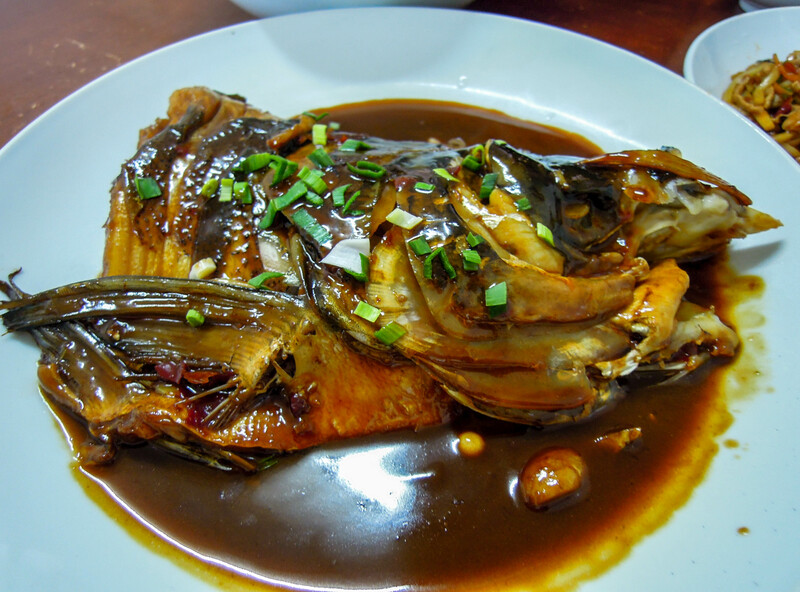 As with most Huaiyang cuisine it is lightly and delicately flavored, and is neither greasy nor smothered in salty soy sauce. It is seasoned with little bits of very fresh vegetables such as carrots, greens, maybe a bit of garlic. It almost always has freshly scrambled eggs and ham. I very seldom order fried rice; actually I never order fried rice, much preferring steamed rice. But Yangzhou style fried rice is the exception. 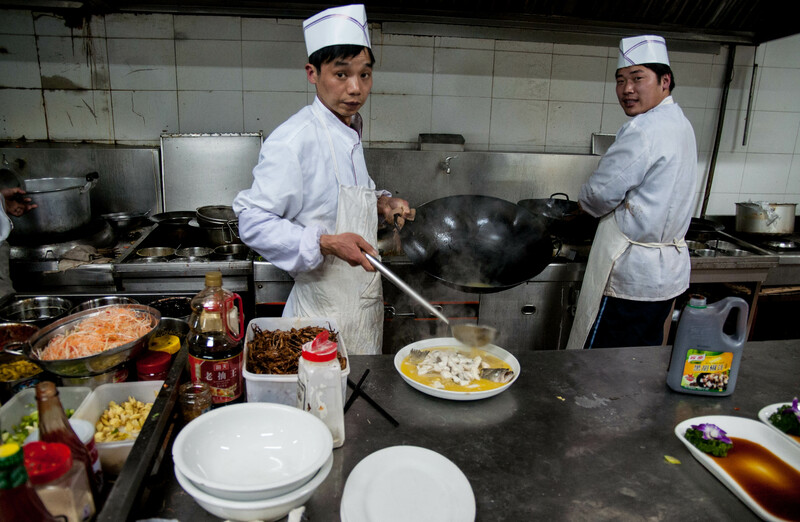 It really is outstanding and the pinnacle of fried rice dishes in China. After this wonderful meal I was feeling very sleeping, and very chubby. In fact, on this trip I had been eating way too much as I was doing research (i.e. eating) on Huaiyang cuisine. Several of my friends and colleagues knew this so they were very eager to take me to their favorite restaurants and order way more food than we could possibly eat. In the future I’ll be posting more about Huaiyang cuisine as well as China’s other cuisines as I continue my research on China’s famous regional cuisines. Let’s just say that authentic Chinese food is more varied, more delicious, and much more exciting than anything you can find here in the U.S.